Naples Cathedral is a Roman Catholic cathedral, the main church of Naples, and the seat of the Archbishop of Naples. 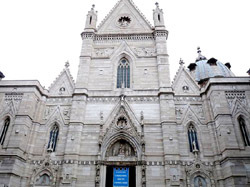 It is widely known as the Cattedrale di San Gennaro, in honour of Saint Januarius, the city's patron saint, but is actually dedicated to the Assumption of the Blessed Virgin Mary. The present cathedral was commissioned by King Charles I of Anjou. Construction continued during the reign of his successor, Charles II (1285-1309) and was completed in the early 14th century under Robert of Anjou. It was built on the foundations of two palaeo-Christian basilicas, whose traces can still be clearly seen. Underneath the building excavations have revealed Greek and Roman artifacts. The Archbishop's Palace adjoins the cathedral. The main attraction of the interior is the Chapel of the Treasure of St. Januarius, with frescoes by Domenichino and Giovanni Lanfranco, altarpieces by Domenichino, Massimo Stanzione and Jusepe Ribera, the rich high altar by Francesco Solimena, the bronze railing by Cosimo Fanzago and other artworks, including a reliquary by 14th century French masters.